There’s a lot of history and culture in the great state of Missouri, but some of these fun facts might have escaped your notice. Here are 15 things you might not have known about Missouri, and some of them will change the way you think about the Show-Me State forever! Stay in Missouri for long and you’ll notice that groups of natives pronounce the name of the state differently. While “Missour-ee” is common, so is “Missour-a.” Furthermore, some people pronounce the first syllable “mih” and others “muh,” and the medial consonant as either an s or a z. Some older people don’t pronounce the last syllable at all. Linguists insist that all these pronunciations can be found as far back as the late-1600s, and that each is found all over the state. While news broadcasters from the east and west coasts have attempted to standardize the pronunciation as “Missouri-ee,” linguists insist no pronunciation is any more or less correct than any other, making Missouri the only state in the union without a single “correct” pronunciation. 3. “The Show Me State” is not Missouri’s official nickname. Though “The Show Me State” appears on Missouri license plates and tourism materials, Missouri has no official state nickname. Other nicknames include “The Lead State” (Missouri is the premier lead mining area in the world), “The Ozark State” (the Ozark region begins in the lower half of Missouri and extends into northern Arkansas), “Mother of the West” (westward expansion with the Oregon and Santa Fe trails began in Missouri), and “The Cave State” (Missouri has close to 6,400 recorded caves, with many more yet to be discovered). 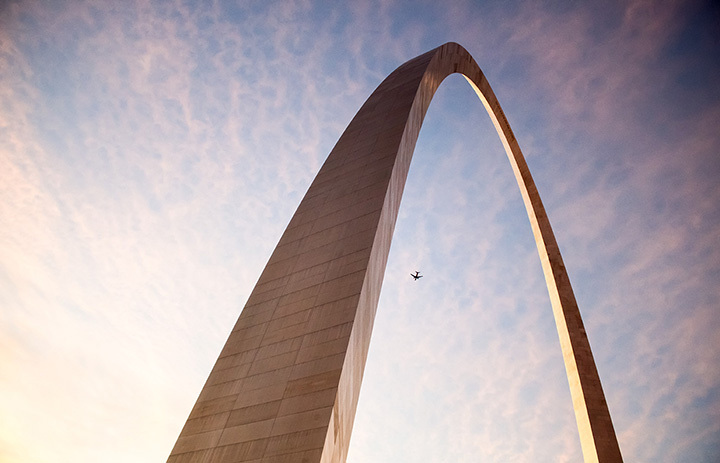 Despite the threat of having their licenses revoked by the Federal Aviation Administration, several small plane pilots have attempted to fly between the legs of the St. Louis Gateway Arch. At least 10 pilots have disobeyed the order—though few, before the age of cell phone cameras, were ever caught. Parachutists, too, have aimed for the Arch—either to land atop it, or glide through it. In one tragic case, a 33-year-old veteran parachutist attempted to guide his parachute beneath the Arch as a birthday tribute to his wife, but landed on top instead. When he tried to regain his balance by holding onto the airplane warning light, his deflated parachute caught the wind and he slid down the north leg to his death. Others parachutists been more successful, though it is important to note that both climbing a national monument and parachuting into a national park are misdemeanors. 5. Missouri has more caves than any other state in the union. Long known as “The Cave State,” Missouri has almost 6,400 caves, four of which are found at Missouri state parks: Onondaga Cave and Cathedral Cave at Onondaga Cave State Park, Fisher Cave at Meramec State Park, and Ozark Caverns at Lake of the Ozarks State Park. Most caves are now tourist attractions, though earlier generations used them as restaurants, hideouts, and speakeasies. Tourist guides in Kansas City occasionally claim that Kansas City has more fountains than the city of Rome…but no one knows how many fountains there are in Rome or in Kansas City, so it’s not clear if the claim is true. The City of Fountains Foundation, a local group dedicated to the preservation of Kansas City’s fountains, counts 200, but it doesn’t include fountains at subdivision markers (there are many) or inside privately-owned buildings (there are many more). Since Rome does not keep a tally of how many fountains it has, the claim that Kansas City has more fountains than Rome cannot be proved one way or the other. But for the time being, it still sounds good on a postcard. About an hour southwest of St. Louis sits the oldest permanent European settlement west of the Mississippi. Ste. Genevieve was settled in 1735 by French Canadians, and purports to be the finest example of a French colonial village in the U.S. Ste. Genevieve is so culturally important, in fact, most of the town was declared a National Historic Landmark in the 1960s. One building, the Bequette-Ribault House (1808), is one of only five remaining houses in the country to feature a post-in-ground design, in which there is no foundation and the walls extend right into the ground. In 1928, the Chillicothe Baking Company, in Chillicothe, Missouri, purchased a bread slicing machine built by inventor Otto Rohwedder. The first loaf of sliced bread came off the line in July of that year and was an instant hit. Ironically, the local newspaper referred to sliced bread as the greatest step forward in the baking industry since wrapped bread…a saying which, not surprisingly, never caught on. About 70 miles to the west of Chillicothe is the city of St. Joseph, Missouri—famous as the starting point for the Pony Express and the death place of Jesse James. But St. Joe has another claim to fame: The humble pancake. In 1889, a couple of St. Joseph entrepreneurs, Charles Underwood and Chris Russ, developed a ready-mixed, self-rising pancake flour, which they named after the minstrel tune “Old Aunt Jemima.” Sold to Quaker Oats in 1925, Aunt Jemima is still the best-loved and most recognizable pancake mix sold in the U.S. Built by Bob Chandler in 1975, “Bigfoot” started making appearances at local tractor pulls and car shows in 1979. The truck became popular enough to make a cameo in a Hollywood movie (“Take This Job and Shove It”), but the real fun began win 1981, when Chandler filmed himself crushing two cars in a field. Car crushing has been a major draw in motorsports ever since. …but they were supposed to be in Chicago. The city fathers of St. Louis made it known that, if the games weren’t moved to their town, they would host their own “world athletic competition.” The International Olympic Committee capitulated, and the Olympics were moved. American athletes showed up in droves, but the unease in Europe caused by the Russo-Japanese War, combined with the difficulty of getting to North America at all (transatlantic flight was still 15 years away) kept most countries’ athletes at home. In addition, the week-long games were spread out to coincide with the 1904 World’s Fair, also being held in St. Louis, and lasted a wearying four-and-a-half months. Missourians are used to strong weather and severe storms, being smack in the middle of America’s “Tornado Alley,” but the deadliest tornado in U.S. history started near Ellington on March 18, 1925. It cut a path over half a mile wide through three states (Missouri, Illinois, and Indiana), killing 695 people and injuring over 2,000. Several rural communities simply disappeared in the storm, never to return, and an estimated 15,000 homes were levelled. Missouri experiences small earthquakes every day, but most are so slight, they can’t be felt by humans. These quakes originate in the New Madrid Seismic Zone, a fault system in southeast Missouri, thousands of feet below the earth’s surface. Though there are frequent earthquakes recorded along the New Madrid Fault, the last great eruptions were in 1811 and 1812, which knocked down houses and caused the waters of the Mississippi to temporarily flow backward. With magnitudes of 7.4 to eight, these remain the strongest earthquakes recorded in modern times east of the Rocky Mountains.